The holidays bring with them plenty of opportunities to reach out and help others. Doing so not only brings some holiday spirit to those less fortunate, it also rewards those who give with a sense of usefulness, having helped another human being in need. 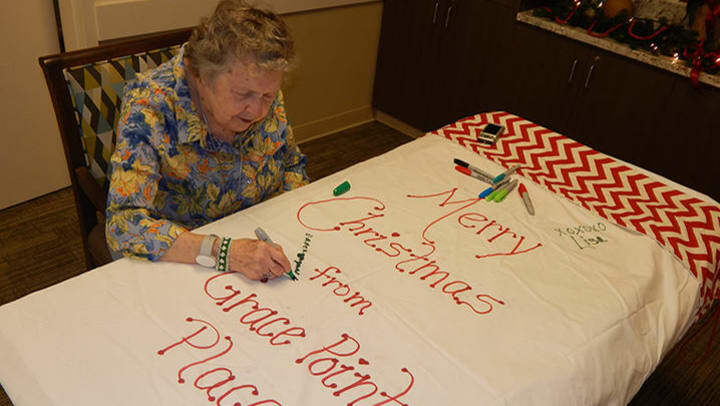 At Grace Point Memory Care in Oak Lawn, Illinois, residents recently got together with nearby St. Linus Church to participate in a special program called PADs (Public Action to Deliver Shelter). The program provides local homeless shelters with much needed supplies, such as warm socks, toiletries and other personal necessities. Grace Point residents, along with staff members, decided to do something unique and fun for the program. They created and decorated an enormous Santa bag which they stuffed with their collected donations. The event was covered by The Reporter, a local publication serving the southwestern suburbs of Cook County. Grace Point resident, Claire Karcher, summed up the experience in an interview with The Reporter. “I think this is a really nice cause and a great project,” she told the reporter. Grace Point Memory care is one of the newest Anthem Memory Care communities, having opened its doors this last spring. Since then they have become active in the local community, reaching out to partner with local businesses and churches, such as St. Linus. The Christmas stocking project, as with others, is a great way of engaging residents with staff and others in the community. “We’re excited to celebrate our first Christmas in Oak Lawn and honored to give back in a meaningful way to the community that’s been so supportive of us,” Cortney Malinowski, executive director for Grace Point Place told The Reporter.